X-Force brings the power of security to your door. Being visited by the IBM X-Force Command Cyber Tactical Operations Center (C-TOC) operatives might sound intimidating, but it’s actually good for your business. IBM has just announced the creation of a mobile cyber security training team under the abovementioned name. The team will travel across the US and Europe and train teams on cyber security, raising awareness and practicing different skills. 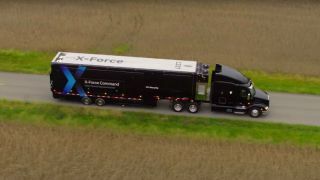 C-TOC is housed in a tractor trailer, IBM said in a statement, adding that the mobile facility provides a gesture-controlled cybersecurity "watch floor," data centre and conference facilities that can accommodate two dozen operators, analysts and incident command centre staff. T-TOC is self-sustainable, has satellite and cellular communication, and is capable of being deployed in various environments. "Experiencing a major cyberattack is one of the worst crisis a company can face, and the leadership, skills and coordination required is not something you want to test out for the first time when you're facing a real attack," said Caleb Barlow, Vice President of Threat Intelligence, IBM Security. "Having a mobile facility that allows us to bring realistic cyberattack preparation and rehearsal to a larger, global audience will be a game changer in our mission to improve incident response efforts for organizations around the world." The facility will start cruising through the States, starting this Thursday, when it will be based at the National Mall in Washington, D.C. We can expect to see it moving through Europe in January next year. You can find out more details about the initiative on this link.